MEMBERS OF LETTERKENNY Town Council are planning to hand a letter of protest to Environment Minister Phil Hogan when he pays a visit to the Donegal town on Friday. Local representatives are angry over the Environment Minister’s plans to abolish town councils — details of which were confirmed last month with the publication of the Local Government Bill. A public meeting was held in the council chambers last night to discuss how to handle the minister’s visit to the town on Friday; he’s due to officially open the a new wastewater treatment works. Some councillors had planned to boycott, or even protest outside the event as a result of the Fine Gael politician’s refusal to meet with them to discuss plans to scrap the council. But it was agreed after the meeting that Mayor Paschal Blake and Deputy Mayor Tom Crossan would attend as a mark of respect to staff members and officials who developed the project at Magherenan. “We decided after the meeting that the mayor would go along and hand a letter of protest to the Minister,” Crossan told TheJournal.ie. “The mayor, in his address will also mention the subject”. Crossan said that Hogan’s response to their request for a meeting on Friday had been “scant,” and described the minister as an “arrogant man”. “Letterkenny is the capital of Donegal and towns like it should be supported through town councils — that’s the point we wanted to make to him. “We have spent the last number of years pumping €300 million of investment into the town — new parks, a leisure centre, a theatre. We’re also the first town in Ireland to appoint a town gardener to decorate the town. Councillor Blake said he would make “just a brief mention” of the authority’s opposition to Hogan’s plan in his speech on Friday, and would be taking a “diplomatic approach” to the matter. However the town mayor also said individual councillors had been treated “with disrespect” by the Environment Minister in the past. Councillors will meet tomorrow night to draft the letter, and both the mayor and deputy mayor said they hoped to have a chance to speak to Hogan at the event, despite his refusal to agree to a formal meeting. Email “"Arrogant" Phil Hogan's visit to be greeted with protest by Letterkenny councillors”. 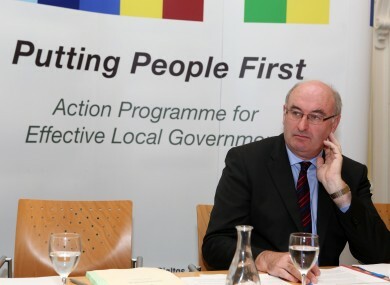 Feedback on “"Arrogant" Phil Hogan's visit to be greeted with protest by Letterkenny councillors”.